In this digital age, it’s become common to spend time staring at a screen. Whether it’s texting on our smartphones, browsing the web on our computers or playing a game on our tablets – there’s no denying we’re a screen obsessed society. Technology has advanced so much in the last decade, opening up a whole world of entertainment at our fingertips. It isn’t just for adults either. Smartphone’s and tablets come with a whole range of goodies to keep the kids happy. Many parents have found settling their little ones in front of a tablet is an awesome sanity-saver, giving them a little peace to recharge and relax after a stressful day. 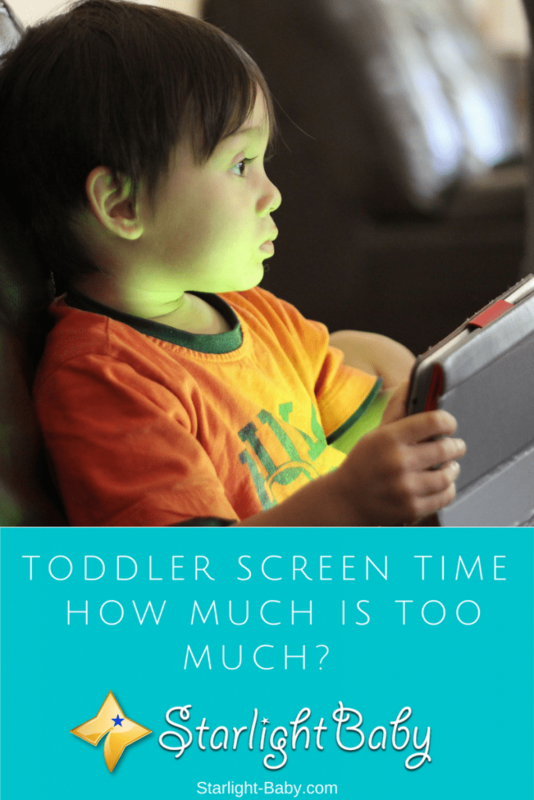 However, is screen time good for toddlers and how do you know how much is enough? Here we’ll look at what the experts recommend and the key factors to consider. How Much Screen Time Should A Toddler Have? You’ll find a wide range of opinions online as to how much screen time is healthy for toddlers. Some will argue you shouldn’t give them any screen time until they are older, while others say moderate screen time is perfectly ok. As far as experts go, for children under the age of two, they do recommend limiting screen time to 15-30 minutes a day, while for toddlers this increases to one-two hours a day. It’s not just about the actual time spent in front of a screen you should worry about either. The type of screen time you’re giving your little one is equally as important. For example, screen time spent using educational apps designed for toddlers can be really beneficial in terms of development. However, screen time purely spent watching cartoons that aren’t very educational can cause issues, particularly with language development. So, in terms of how much screen time should your child have, a maximum of two hours is the popular recommendation. However, as a general rule it’s better to opt for an “as little as possible” guideline. It’s also important to note that the one-two hour recommendation is based upon screen time being spread out over the day. You shouldn’t let your toddler use a tablet or smartphone for two hours straight. Instead, split it down to 15-30 minute sessions. As with any aspect of parenting, the choice is ultimately yours when it comes to choosing how much or how little screen time your toddler has. However, it is helpful to understand both the pros and cons before you make a decision. While some may look at the distraction benefit as “lazy parenting”, the majority of parents will know exactly how vital distractions can be for their sanity. When you’ve tried absolutely everything to settle your little one down but nothing has worked, getting a little peace for half an hour thanks to a mobile device can be a huge relief. It’s not bad parenting, it’s a vital coping skill. As long as you aren’t giving them screen time every time they start to make a fuss, it isn’t going to be a problem. Like anything, the key is moderation. Screen time can also be educational for toddlers too. In short bursts, educational apps can help your little one learn new colors, numbers and words. This is especially true if you’re using the app with your toddler and helping them to learn. Finally, some experts highlight the fact that using smartphones and tablets is a great way to instill digital skills into our children’s lives – something that’s become increasingly important over time. Workplaces today look for candidates that are digitally savvy, so in the long-erm, if used in moderation, screen time at an early age can help your child develop skills needed in today’s society. If too much time is spent in front of a screen, it can lead to brain development issues. This is largely linked to television watching, but can be impacted by mobile and tablet screen time too. The real worry regarding toddler screen time however, is that it will prevent them learning real world skills. Toddlers learn by interacting with physical things. They need to learn how to interact with people and objects. So, if they’re spending more time in front of a screen than they are playing in the real world, it can have a negative effect on their development. If they’re spending too much time in front of a screen, it’s also going to affect the parent-child bond. It’s important to never replace parent and child time completely with screen time. It’s easy to just stick your toddler in front of a device when they’re playing up, but spending actual time playing with them is much healthier and can even prevent behavioral issues. Sometimes toddlers simply crave your attention so they get it any way that they can, even if it’s through acting out. If you ensure you spend enough time with them, you may find their bad behavior diminishes. Too much screen time is also going to promote unhealthy habits. If they get used to staring at a screen for long periods of time each day, they’re going to carry that on into the rest of their childhood and even adulthood. So, encourage them to play outside and experience the real world as much as possible to avoid this becoming an issue. Overall, these days’ children do spend far too much time in front of a screen. While in small doses it can be beneficial for both you and your toddler, it’s important to ensure it isn’t being used as a replacement for real world interaction. Don’t feel bad if you let your child have a little screen time each day, just be aware of the guidelines and ensure they get a lot more off-screen than on-screen time. Thank you so much for this article. I’m going through this right now. My son is at the age where he is starting to get more and more interested in technology – phones, tablets and such. It’s so hard to set boundaries and time limits which he must obey. It’s a constant battle. I’m afraid that he might get too addicted to these things and that it will affect his development – especially the social side of it. I guess you are right though, if the time he spends using these devices is within a normal range it can be beneficial as well. Jane Lee, I guess we’re on the same boat with regards to setting limits. Sometimes it becomes frustrating. At times I need to be really strict so my kids would put down their gadgets/mobile phones. But it’s not all bad because my youngest child learned a lot from watching educational shows from YouTube before she even started pre-school. It should be moderated though, and they should be encouraged to do some physical activities and use their imagination. You are right screen time is a distraction, when I have a lot of work I prefer to know my son in front of its tablet or PC and not bugging me all the time. Is also true that it is useful in education as well, but I think that our kids start to abuse using the tablet, PC or phone. In my opinion an hour a day is enough, the rest of the time it should be used for school or playing outside! You’re right, wallet. Parents do tend to divert their child’s attention to a gadget or television when they are busy. It becomes the ‘nanny’. I am also guilty of this at times, but I do my best in encouraging them to do something worthwhile instead of using gadgets. I would usually ask them where they’ve put a toy we’ve recently bought, and when they do remember the toy, they play with it and use their imagination. Encouraging them to play with other kids will also divert their attention away from gadgets. This is the question we have to tackle soon. Our baby is just five months old, and when his mother and father are watching TV, he also stares at the screen. Based on the early observation, I am sure the toddler will be glued to screen. How to limit his love for screen is the problem soo we will be facing. How much is too much depends on number of factors? Some parents say two hours in a day is enough, whereas someday the toddlers can be allowed to watch TV for 3-4 hours. The disadvantages stated above are really disheartening. I will make sure, our toddler will not watch TV for long hours. Yes, the consequences of too much screen time are real. Add to this the fact that it can affect their vision/eye health. As they say, anything that is too much is not good. My kids’ pediatrician doesn’t advise of one to two hours screen time depending on the child’s age. She says 30 minutes per day should be enough. If it cannot be avoided, she said the eyes should be focused on something else for a few seconds every 15 minutes, away from the screen. The perks that comes with technology is very interesting and intriguing when learning is concerned, the world took a whole different dimension with the improvements in its technological advancement. So it’s right to agree with the points mentioned on this article about the advantages of child’s screening time which were ; It’s an excellent distraction, It can be educational and can help them to develop digital skills. But care should be taken with doing it excessively because there are disadvantages that comes with it as well. True. Gadgets/mobile phones/tablets do have advantages especially when it comes to educational use. It’s easier to teach a child about animals, colors, etc. with the use of smartphones/tablets. Children are more receptive when they can see the actual things rather than hear its description. But as they say, too much of everything is not good so the use of gadgets by kids should be under parental control.